What is INFORMATION or IN-FORMATION?. Wikipedia: "Generally speaking, the concept of information is closely related to notions of constraint, communication, control, data, form, instruction, knowledge, meaning, mental stimulus, pattern, perception, and representation." We will explain here how "information" is in essence related to the dynamic "shape", "formation","structure" or topological properties of the holons (multi-layered spaces) with which they are associated. First, on the Riemann space page we show how enveloped (Origami) or 3D-positions (like braille) of a original flat surface represent information. For example we call (give a name) a specific bended paper a "dog", because the shape of the paper "object" reminds us of a real dog, but in reality it is just bended paper. So name-giving is our way to describe a certain "object" or "event", where such object occupies a real or virtual "space" and the event refers to a certain process/action in a certain space (a frame of reference). By name-giving we refer to a specific "space", that is given - by intellectual and/or social convention - an IDENTITY. However identity doesn't reflect the real structure or the dynamic structural processes of objects. Secondly, all objects and beings are dynamic spaces with a specific configuration, thus have a unique dynamic structure. But all objects and beings - both 3D - are complexes/combinations of hidden, smaller, dynamic spaces - like molecules, and smaller 3D-spaces called atoms. And atoms, again are composed of electrons which encircle a nucleus space, in which proton spaces and neutron spaces co-exist, where according to actual mainstream science these neutrons and protons are composed by quark spaces, which are interacting through gluon particles (spaces). Both quarks and glouns have color charge. Where quark spaces are descibed as spinor fields, and gluons as vector fields, having inside "flux tubes", where vector fields are one kind of tensor field on the manifold. So quarks and gluons are still "spaces", thus being specific combinations of fields. Here we touch also the problem of the wave-particle duality. Since we speak here about fields we can look what geometry can tell us. We can look to the geometric concept that matter and energy are simply different types of curvature of space. Influenced by the non-Euclidean geometries of Bernhard Riemann and Nikolay Lobachevsky, William Kingdon Clifford presented in 1876 such idea. He was thus preambular to Albert Einstein's GR, who called this "deformations" of spacetime or topological defects. Riemann Riemann showed in 1854 - based on a crumpled paper ball - that as there are different kinds of lines and surfaces, so there are different kinds of space of three dimensions, including hidden dimensions. To this I add that parts of that crumpled Riemann paper surface can couple locally (say: making a local enfolding/origami), that entangles both parts of one surface or of two surfaces into a new spatial union (co-existence spaces). It's like a self-glueing property. So the parts of the surface(s) are now entangled in a joined multi-layered space, called a holon. As such this causal concept demystifies the quantum superposition. The rational of quantum entanglement can be explained in a very simple geometrical way without any quantomatic pooh or Quantum Superstition as delivered by a number of Quantum Cardinals. Only David Bohm tried to avoid this. By topological holons we can explain in a simple geometrical way how parts of pure energy - represented by a dynamic fundamental membrane being a background field - can be entangled in an orthogonal way, creating that way dynamic spaces. Now, coming back to the rationals about "information". It's important to understand that topological holons are local ENERGY STORAGE spaces. They are like a capacitor or a battery that holds energy for a given time, and then release that energy, or a part of it. 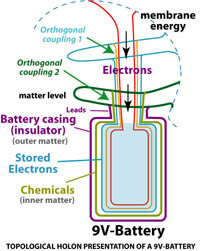 The outside layer of a topological holon acts as an INSULATOR that protects/holds the inside energies, and is at the same time the TRANSFEROR of (in/out) energies, like the leads of a 9V-battery. Now the energy, the electrical current , so electrons - is stored INSIDE the insulating casing (the outer layer). Inside the insulator layer is a layer of chemical elements (spaces) which are able to store the electrons and release them. Following this geometric concept we can say that holons are topological MEMORIES. Indeed memories are spaces which store energy. Where above mentioned energy storage spaces like the 9V battery loose their inside energy (give back, release), memory spaces will hold their energy since the energy is stored in the full holon structure, thus also in the outer layer. It's almost like when the outer shape of the 9V-battery would change to a AAA-battery shape or a 1.5V-battery when the energy level changes. Memory processes are dynamic. So memory spaces are not absolute, their general structure OR their smaller sub-holons can change by energies received from the outer systems ( ie. food, communication, radiation, ...). Their shape/structure adapts following external energy input. And changes in the general shape or in a sub-holon will change the vibrations (frequency) of whole holon. I will explain this in a simple way. Holons are like bells . Every bell has a unique clapper and a unique cup. The unique structure of the clapper and that of unique bell give - on interaction - a unique sound (unique timbre, frequency, pitch, wavelength, ...). That's the repeatable scientific information (in Hertz) we do the measuring of the sound of "that" bell". For example we can compare the unique sounds of the Big Ben in London, London 1400, the Great Paul, the Taylor 1980s, Mears Bell 1859. On Bill Hibberts website you can find more unique bell sounds under "Bell Collection" lists. 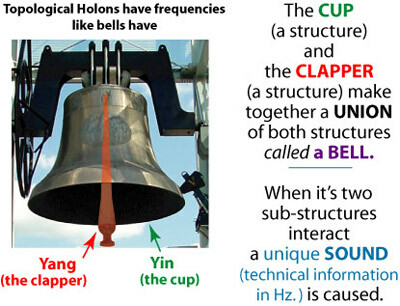 The formation (structure) of a bell stipulates/determines it's "information": like the Great Bookham Bell has a tenor nominal of 956Hz. That sound information refers to the unique dynamic structure (clapper + cup) that produces - nominal - 956Hz. We may - but must not - associate this 956Hz bell with a certain name: Great Bookham. (conventional Identity). Calling this specific bell the Big Obama or Idiot Bush will not change it's sound. The name doesn't matter. However we can add some metal plates, bolts, bumpers, paperclips, or mini-bells (all sub-holons) on the clapper and/or on the cup of "Great Bookham". Such addition, or taking away some parts (sub-holons) of the clapper or cup, will give a new different sound, i.e. 1001Hz. So changing the structure causes a change in real scientific information (956Hz becomes 1001Hz). However we can keep that great name: Great Bookham. In our dynamic universe the structure of all holons ( all multi-layered spaces), and their unique frequencies, changes constantly. These structural changes are caused (1) by direct and indirect contact with other holons, (2) by changes in sub-holons in a holon and (3) by the general vibrations of the membrane. Where the single membrane is the mediator of the vibrations. We can apply this approach on binary computing systems. Next is a simplified presentation. Hardware or magnetic spaces can be filled with electons when gates are opened. Then gates are closed. When the spaces are filled the EM-properties of the spaces change and that can be noticed by external systems. Some people, like Milo Wolff, state that fundamental particles are waves. However this is contra-logic. We can look to what happens with water vapor, water and ice. A simple image: the membrane is like water. Liquid H2O. However with water you can not build a "structure". For that you need to cool the water to 0°C or below. Then the liquid water becomes Ice, which is structured H2O. With structured H2O you can build igloo's and ice-plates 'in which you can carve symbols ( = in-formation, identity, uniqueness ... a local system with proper integrity. The igloo is still H2O ... but has - by it's structure - unique properties like dimension, thickness, shape, location ( = making a unique igloo). So to create some"thing", the pure energy (Wu chi) needs to be transformed or converted into structure. That's what I do with the membrane and it's subsets (holons). I - locally - retard local dynamics into a local structure, which is multilayered. Holons are knotted energy. So I retard the energy into local "shape". Similar like I would take 10 Cubic meter of water and cool it down to make 12 Cubic meter ice (in crystal the atoms take more volume/space). The water-molecules couple and transform in ice for a given time. And with ice you can build igloos and make ice sculptures, and engrave symbols in it. Indeed "in-formation" means "in-a-structure". 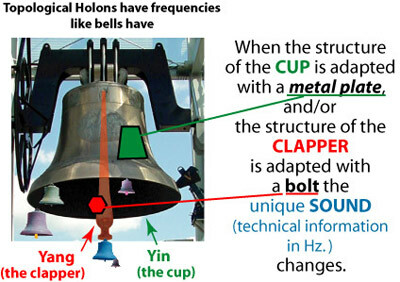 The bell - by it's building up of clapper and clock - has a unique sound (frequency), it's identity (=information). The local enfolding (coupling) of a dynamic non-breakable membrane can create "local space" (sub-set, a holon) that has due to it's multilayered (endo, meso, ecto) structure: unique internal dynamic and unique frequencies, which may lead to inside sub-holon generation. Thus each holon "is" IN-FORMATIE (= information, = Identity). Outside energies (medium) will influence the (inside-outside) holon-structure. Here I want to refer to Maturana's "structural coupling", which is very similar. 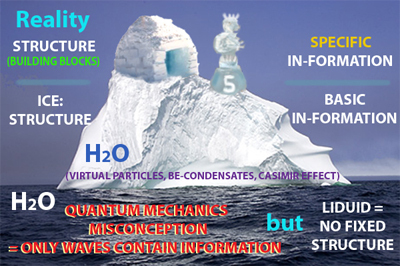 Quantum Mechanics, in my opinion, only look to the sea level (wave interferences) to understand nature. The sea (water) is however only one phase of H2O. Once water is transformed into ice it will contains geometric (fixed) information. With ice we can build igloo's. With ice we can make ice-sculpture. Such information can never be stored by water waves. In my approach the basic holistic membrane is the dynamic sea level. But that can create local discrete zones by topologic couplings. These holons create the basic order that Bohm called the implicate order. Quantum uses a very poor and simplistic analogy: "A useful analogy is to consider our observable universe as a mass of waves on top of an ocean, whose depth is immaterial." Better and more logic would be: The zero-field energy is like a mass of waves of an ocean, and on top are some spots of ICE, and with ice we can build igloos and skyscrapers, and in this ice we can carve "information". Events like "virtual particles, BE-condensates and Casimir effects" are manifestations of that zero-field energy, like that ice on the ocean water. Both are H2O, but ice - having basic 'structure' - thus building blocs to construct larger structures. In example: If the virtual particle disappears again, it's like ice transforming again in liquid. But if the virtual particle action is strong enough, it become a fundamental particle (photon, electron, quark, etc), which can build up with other particles to atoms, molecules, etc. So our observable universe is like a mass of ice on top of the water waves of an ocean. In addition some old posts on a forum. 1. To me information is a state of energy hold in an isolated frame. Information is essential a state of unbalance. 2. Isolation is key. Without isolation no unbalance. One would become zero again without isolation. Isolation means a boundary. Where does the boundary comes from? 3. Next question: Information about what ... coming from where? Clearly from event(s) that what was/were 'before'. So the cause or causing factors. Previous parameters which were excited and caused the unbalanced state of energy. 4. Previous? So there must be history. but: History that STILL HOLDS to found the present! [cfr. how the historical combinations of atoms (Past) make a specific neurotransmitters-molecule (Now)]. Thus previous information still 'in-corporated' inside the Now-event. 5. Now the prime key however is what is energy? Here we see the heuristic paradox. Correct interpretation of Einstein leads us to conclude that Energy is a specific expression of space-time. So 'sub-energy hold in an isolated frame' means: spacetime incorporated in spacetime. So information is a sub-set of spacetime in relation to a specific level of in another way (hierarchic) expressed spacetime. Now we come to my own theory about an unbreakable membrane that has a self-fertilizing infolding. With the pelastrating membrane such essential historical integrity is reached in an engineering approach. Next to the internal or local interactions (inter-actors) the Membranes (in essence a SINGLE membrane) are conductors of LOCAL + NON-LOCAL oscillations. LOCAL INTERACTION: In the animated gif above: http://www.superstringtheory.com/fo...ages13/319.html you can see how knowledge (information) knots are created. The purple event couples three layers of spacetime. In our consciousness discussion you may say that the lowest red layer represent Jung unconsciousness, the mid-layer the individual unconsciousness and the blue top-layer of spacetime: individual consciousness. NON-LOCAL INTERACTIONS: Each of these three layers are just extensions as 'different' layer networks, which finally are united again in ONE deeper membrane layer again. I repeat: in essence it's a SINGLE membrane. I call the transfer of information over non-local sub-membranes: membrane causality. So it's is a mechanism of restructuring spacetime ... No tricks, No magic superposition ... show of hands. That there is mechanism doesn't mean that Deistic idea's are excluded. People who want so can say: 'That's how HE did it ... maybe'. Historical integrity leads to memory and brings storage of experience. Next links may give you some extra mental pictures or reflections. What about Synchronicity of C.G. JUNG. How to explain this with pelastration?